Canon 750D features newly developed 24 Megapixel CMOS sensor (3rd gen) with HYBRID Phase AF pixels inside it, the AF module of Canon 750D features 19 Phase AF points to acquire AF. Canon 700D is limited to 18 Megapixel sensor but it features Hybrid CMOS AF sensor (1st gen), the AF module of Canon 700D is limited to 9 AF point. So at the end the Canon 750D features advance and better sensor compared to old Canon 700D. 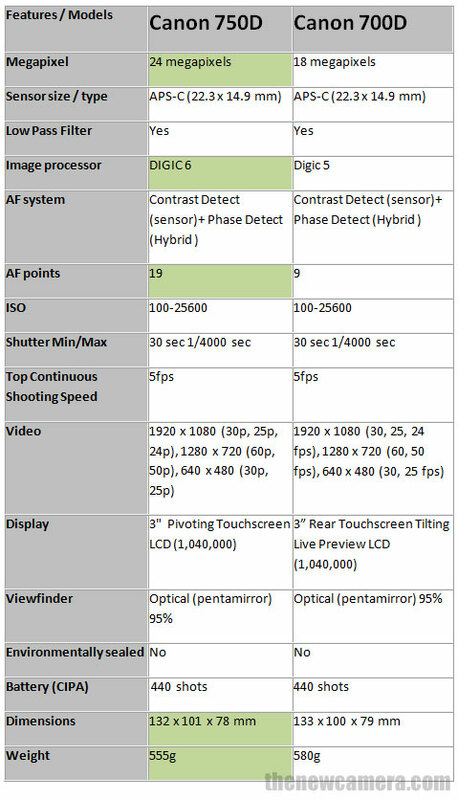 More AF Points in Canon 750D: The Canon 750D features a 19-point all cross-type AF system whereas the Canon 700D A 9-point all cross-type AF system, so we are sure that Canon 750D will do faster AF compared to Canon 750D. Third generation of HYBRID CMOS AF on Canon 750D: The Canon 750D will do AF faster compared to the Canon 700D while using display screen and video mode since the Canon 750D features Third generation of HYBRID CMOS AF tech. inside it and Canon 700D built with First generation of HYBRID CMOS AF Tech, however.. number of active phase AF points within the sensor is still unknown and not disclosed by Canon. ISO Range – The ISO range remains limited to ISO 25600 for both the camera, but we have to keep in mind that the Canon 750D is offering more resolution as well as DIGIC 6 Image Processor, so we will sure get cleaner images compared to Canon 700D. WiFi and NFC -The new 750D arrive with built-in Wi-Fi connectivity. When used with the Camera Connect mobile app users will be able to quickly and effectively upload files directly to social networking sites. Also, with NFC the camera can be paired to compatible mobile devices quickly, as well as to the CS100 Connect Station. Verdict: We highly recommend you to buy the new Canon 750D camera, since it features advance AF system and new HYBRID CMOS AF sensor, the WiFi and NFC connectivity features is also added. Current Canon 700D users must upgrade there camera and buy Canon 750D DSLR. Seems that most reviewers see Wi-Fi on a camera as a social media enhancement. Rather many pros see it as a way to remotely operate their cameras even though the rebel camera isn’t considered apeo line camera.